Enjoy a special day with your family and friends! 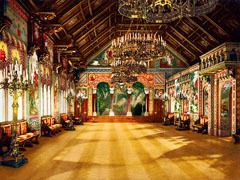 Many of the most important castles are open during the winter, so it is a great time to visit them without the crowds! No surprises, missed connections, searching for the right places, or standing in line for tickets. We're very flexible - we'll be happy to change features to make the day perfect for you! We also can serve as your guide to other day trip places, such as Kitzbühel or Augsburg, or organize a multiple day short tour to places like Prague and Vienna. We will be happy to put together a custom tour for you. Theses tours are available from November through February. You are picked up at your Munich hotel, and we head south to the beautiful Bavarian Alps and the village of Hohenschwangau. 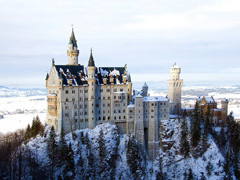 From there you will visit King Ludwig II's Neuschwanstein Castle and take a guided tour of the inside with a local castle guide. 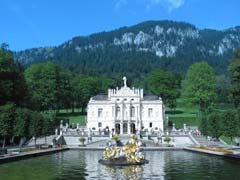 Then there is time for a hot meal before heading off to another of Ludwig II’s castles, Linderhof. This elaborate rococo estate is the only one of his castles where Ludwig actually lived. We tour inside the palace with a local castle guide, and you have time to go for a stroll in the formal gardens. You are picked up at your Munich hotel, and we drive east along the northern edge of the Bavarian Alps to the baroque city of Salzburg. 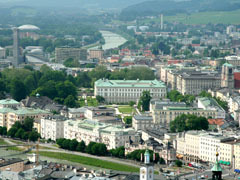 This world famous city of Mozart and Sound of Music is steeped in history and culture. Being the capital city of one of Austria’s premiere ski regions, Salzburg also has a rich winter tradition. Most of the city’s highlights are easily accessible in winter, and we will start with a walk through the old town, which has been on the UNESCO World Heritage list since 1996. You will see Mozart’s Birthplace, explore the Cathedral and other historic churches and stroll down the Getreidegasse, probably Europe’s most beautiful shopping street. You can then have a bit of lunch in a truly historic setting. Enjoy plenty of free time afterwards for sightseeing, shopping or a visit to a traditional Kaffeehaus, where you can try the famous Salzburger Nockerln. 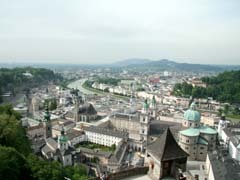 In fine weather, a trip up the funicular to Fortress Hohensalzburg for fabulous views around the city is definitely a highlight. In the late afternoon you are returned to your Munich hotel or pickup point. 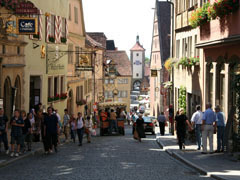 You are picked up at your Munich hotel, and go northwest to the pristine medieval town of Rothenburg ob der Tauber, where you will feel like you just jumped back in time to the 16th century. Completely surrounded by medieval ramparts with countless towers, Rothenburg is famous for its ancient houses, fountains, hidden corners and street signs. Also famous for the Meistertrunk, in which – according to legend – the Burgereister saved the town by emptying a 6-pint tankard in one single draught. Time for lunch and stroll through the cobbled lanes and perhaps a visit to one the Christmas stores, including the original shop of Käthe Wohlfahrt, the most famous Christmas shop in Germany. Afterwards we take the Romantic Road to Dinkelsbühl where you can admire another fully walled city that is still a normal functioning town. Further on down the Romantic Road we will pass by the impressive 900 year old Harburg Castle, which unfortunately can only be admired from the outside during the winter months. Return to your Munich hotel or chosen pick-up point. You are picked up at your Munich hotel, and go south to Bavaria to Garmisch and the Zugspitze, which at almost 10,000 feet is Germany's highest mountain. 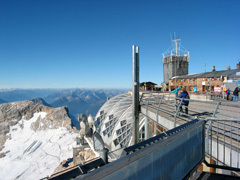 In fine weather the Zugspitze has a matchless panorama at the top of the Alps. The fact that there are three ways up to the top is testimony to the Zugspitze is a popular year round destination (we take one of the two cable cars). Have a hot chocolate or mail your postcards from the top of Germany! Then we return to the Olympic town of Garmisch, Germany's No. 1 winter sports resort, with a beautiful historic centre. There will be time to enjoy the city center before heading back north to stop in at Ettal, which boasts one of the finest monasteries in the Alpine region. You will have time to visit the Basilica, which was founded by Emperor Ludwig the Bavarian in 1330. Ettal is also well known for its beer, cheese and liquor, and you will have the chance to sample these before we are head back to your Munich hotel. If the weather prevents a trip up to the Zugspitze then we will add a visit the beautiful Passion Play village of Oberammergau. This mountain town is known for its house frescos (Lueftl painting), woodcarvers, and Christmas shops. You have free time to explore a bit on your own, do a little shopping, or warm your bones with a hot drink in one of the quaint local inns. You are picked up at your Munich hotel and we drive south through the Alps along the valley of the Inn river to the Tyrolean capital, Innsbruck. Time to explore this most charming city, which hosted the Winter Olympics in 1976. See the famous little Golden Roof, the beautiful baroque Cathedral, and visit the Hofburg, Empress Maria Theresa's summer palace. You can go shopping or just enjoy the fantastic mountain backdrops all over town. A definite highlight is the tasty Sachertorte at the famous Sacher Café. 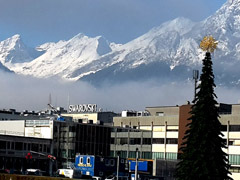 We continue on a short ride to the Swarovski Crystal World (Kristallwelten) in Wattens, a true feast for the eyes and all of the other senses as well. Afterwards we will head north back to your Munich hotel or pick-up point. You are picked up at your Munich hotel and we drive east through the heart of Bavarian farm country skirting the alpine foothills until we reach Altötting, a charming town famous for the Chapel of Grace (Gnadenkapelle), one of the most popular pilgrimage shrines in all of Germany. The history of this spiritual center of Bavaria goes back 1250 years. Here you can also see urns holding the Hearts of the Bavarian Kings, including that of Ludwig II. Then it is on to Passau, where the Danube is joined by the Inn and the tiny Ilz rivers. This city has roots dating back to Roman times but was recreated by Italian baroque masters after a devastating fire in the 17th century. Visit St. Steven’s on Passau’s highest point and hear the world’s largest cathedral organ. Other highlights include the gothic Town Hall, the New Bishop's Residence and of course the confluence of the rivers, which are visibly different colors as they meet. There is plenty of time for shopping, strolling along a river promenade or to explore the many romantic lanes and charming nooks that Passau has to offer. Then it is back west to Munich and your hotel or pick-up point. These tours are offered from November through February. Prices are per person, in Euros.